Professional-grade weatherproof IP66 outdoor power amplifiers. These amps install anywhere from deserts to ski resorts, from sea-side to pool-side, from factory floors to country clubs to sports arenas. Available with output power right for every application, from small patios up to the largest stadiums. Wireless networking available. * Nano is stereo, and uses Bluetooth for audio input. Other PowerChitons are mono and offer two standard analog inputs with internal mixer. PowerChitons are perfect stand-alone amplifiers to drive loudspeakers of your choice. Or, add optional interfaces like Wireless, Ethernet, or Twisted-Pair Analog for networked or long long–range use. Need local volume control and user-accessible inputs? Add a companion weatherproof mixer ‘front-end’ – our BreakoutBox- or BreakoutBoxXL to build a complete weatherproof PA system. Two line-level inputs, volume of each adjustable via internal mixer. Ducking circuit (switchable) lets you mute one audio source when audio is present at a second input. Great for ducking background music to let voice announcements or warnings be heard clearly. Not available on standard PowerChiton Nano. Expandable with optional Ethernet, wireless (900 Mhz, Bluetooth, Wifi), or twisted pair audio interfaces. Selectable Output Range: full-range OR high pass (85Hz+, 350Hz+) OR low pass / subwoofer mode (85Hz and below). Easily connect Technomad weatherproof loudspeakers, and your audio source (iPod, receiver, CD player) or Technomad Schedulon for the ultimate all-environment outdoor sound system. » Download the new PowerChiton Application Guide for a full overview. Applications: distributed audio systems, pole-mount audio, themed entertainment, concert delay systems, outdoor paging systems, installed audio where no equipment room is available, networked audio over IP, mass transit / train yard audio, wireless audio distribution, airport and boat terminal audio, more. The PowerChiton series of weatherproof outdoor amplifier modules represent a new approach to outdoor audio systems. 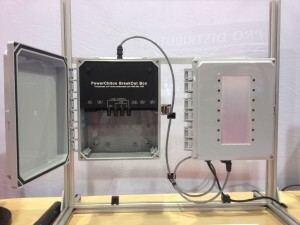 Combining a high performance, passively cooled amplifier with a IP66 rated, low-profile enclosure, the PowerChiton offers the system installer or designer a new solution for the problems of distributed outdoor audio system design. Each PowerChiton monoblock amplifier module is capable of powering an @ 2.6 Ohm load and therefore can drive one, two, or three 8Ω loudspeakers (Nano maximum two 8Ω loudspeakers). Due to the efficient design of the amplifier module, only a passive radiator is needed for cooling – even in extreme desert environments – and there are no moving parts in the module, reducing failure points. While they were optimized for use with the Technomad Vernal, Vienna, Noho, Berlin and Oslo weatherproof loudspeakers / subwoofers, the PowerChiton can be used with any eight or four ohm loudspeaker. Minimum presented load should be 2.6 Ohms or greater. The PowerChiton base model ships with two line-level inputs, which can be independently adjusted by an internal mixer (PowerChiton Nano is the exception, ships with standard Bluetooth interface and no internal mixer). The PowerChiton has available expansion options enabling it to work on an Ethernet network (accepting any bit-rate MP3 format audio for VOIP or Audio-Over-IP applications), RDL™ Twisted Pair installation, or wireless distribution system. When combined with Technomad’s wireless transmitter, the PowerChiton system provides an unrivaled way to distribute audio and amplify it at maximum quality. The PowerChitons can be wall-mounted with the included mounting feet. Pole-mount adaptors are also available as well as hardware allowing the modules to be installed on the back of the associated Technomad loudspeakers. Q: Yes, but what is up with that name? A: A Chiton (pronounced kī’tŏn’ , like the “Ki” in kite and “Ton” like a ton of bricks) is a handsome, tough marine mollusk, which weathers the harsh tidal zones of the Pacific Northwest and other areas with ease. More information on Chitons here. 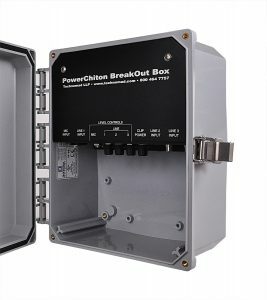 BreakOut Box – adds lockable enclosure with integral 4-input mixer – use it to connect an XLR mic or line-level inputs. 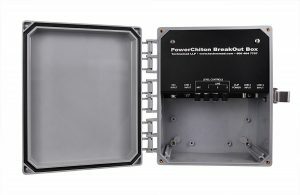 Ideal for post-mounted systems – directly connect to your PowerChiton via the BreakOut box. New! BreakoutBox XL holds up to 3 wireless microphone receivers, plus room for handheld mics and accessories. The outdoor amplifier module shall be a single passively cool type integrated into a weatherproof, polycarbonate NEMA enclosure rated for IP66 exposure. The unit shall be fuse-protected and capable of operating off of either 120vAC or 220vAC power. The unit shall offer options for flange mounting and pole mounting. The unit shall be rated at UL 94 for flame resistance. The unit shall be UL rated for UV resistance. The unit shall be capable for operating a 8 Ohms, 4 Ohms and 2.6 Ohms. The unit shall have a THD + N less than .01%. The unit shall have a total efficiency of better than 81%. The unit shall be expandable to operate as a network audio device with optional Ethernet module. The unit shall be passively cooled via an exposed, weatherproof aluminum heat sink. 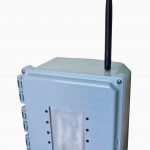 The unit shall be expandable to operate on a FM wireless system with optional wireless module. The unit shall be expandable to operate with RDL Twisted Pair™ distribution systems. The unit shall be a Technomad PowerChiton Outdoor Amplifier.